How do you make learning relevant? One way to do this is to use examples that are local and familiar to students and park visitors, such as a favorite rock formation or lake that they can visit and to which they have intellectual and emotional attachments. 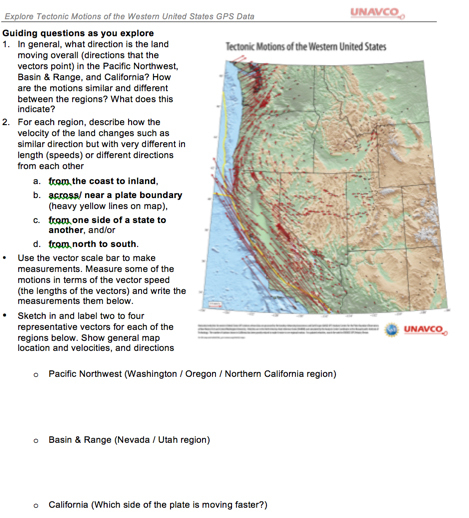 With the GPS data available through the EarthScope Plate Boundary Observatory (PBO), UNAVCO has created a suite of regionally-focused educational and outreach products that can be used in formal and informal education settings. 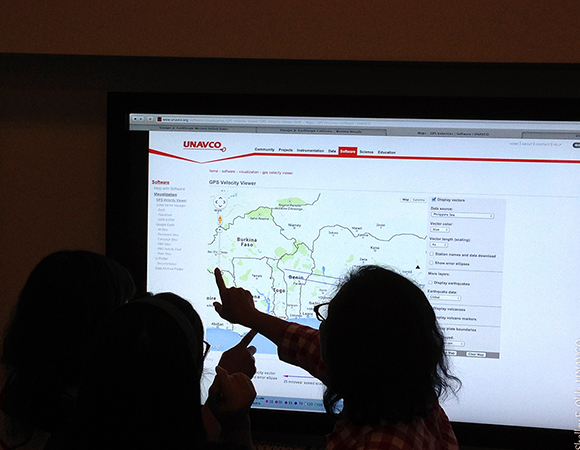 To encourage the use of place-based data-rich resources, instructors provided educators at three workshops experiences using regionally-focused data often combined with other similar examples from around the world. 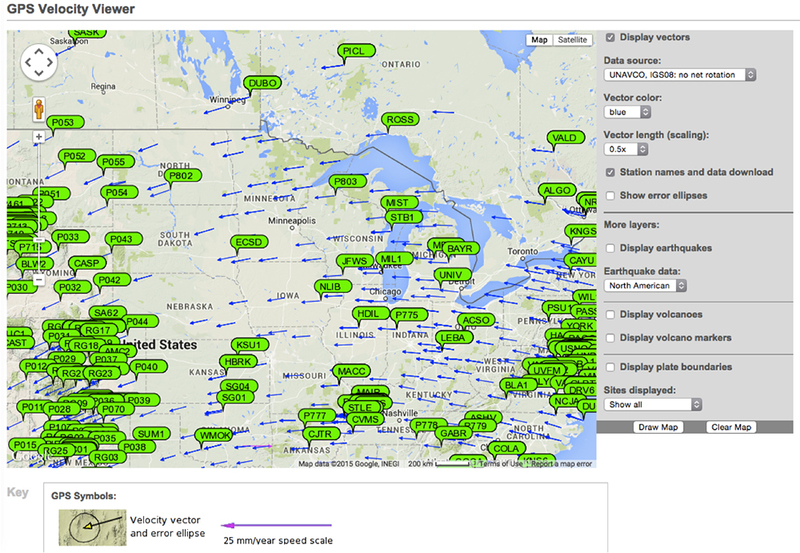 Two of the workshops, hosted by EarthScope, were geared for K-12 teachers and were held in Tempe, Arizona in March 2015 and Cass Lake, Minnesota in August 2015. 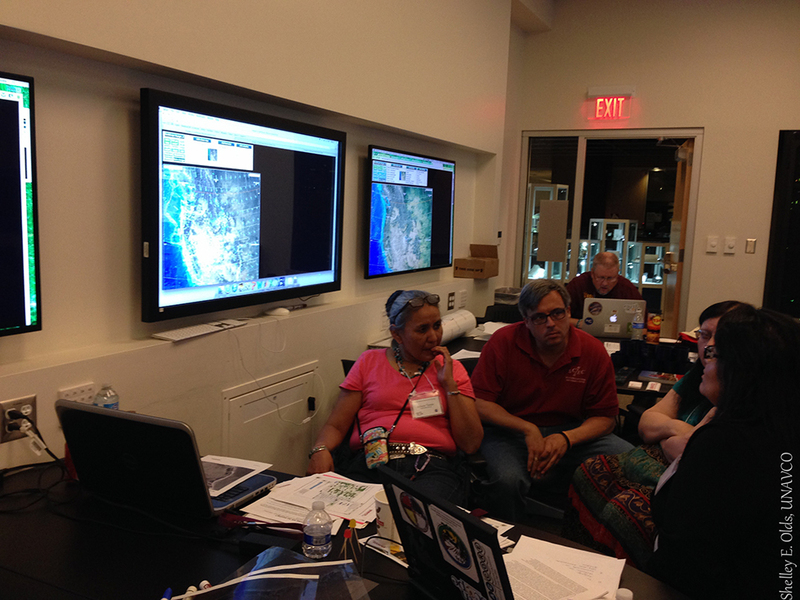 The third workshop, hosted by the Federation of Earth Science Information Partners (ESIP), was geared for high school teachers, college faculty, and park interpreters and was held during ESIP’s annual meeting in Pacific Grove, California. EarthScope invited teachers from schools with majority Native American student populations to participate in two Native Science Educators Workshops (NSEW), one in Arizona and the other in Minnesota. These two-and-a-half-day workshops provided Earth and environmental science teachers science content, lesson plans, and hands-on field experience that can be used at their schools. The content covered included plate tectonics, plate motion, and plate deformation; regional geology; natural hazards; and earthquake safety. Facilitators came from many institutions to co-teach these workshops. Institutions represented include EarthScope, IRIS (Incorporated Research Institutions for Seimsology), USGS, SCEC (Southern California Earthquake Center), Hamline University, University of Minnesota, and Montana State University. UNAVCO featured GPS data from the EarthScope Plate Boundary Observatory and other networks in both workshops to illustrate regional and global tectonic motions and deformation. 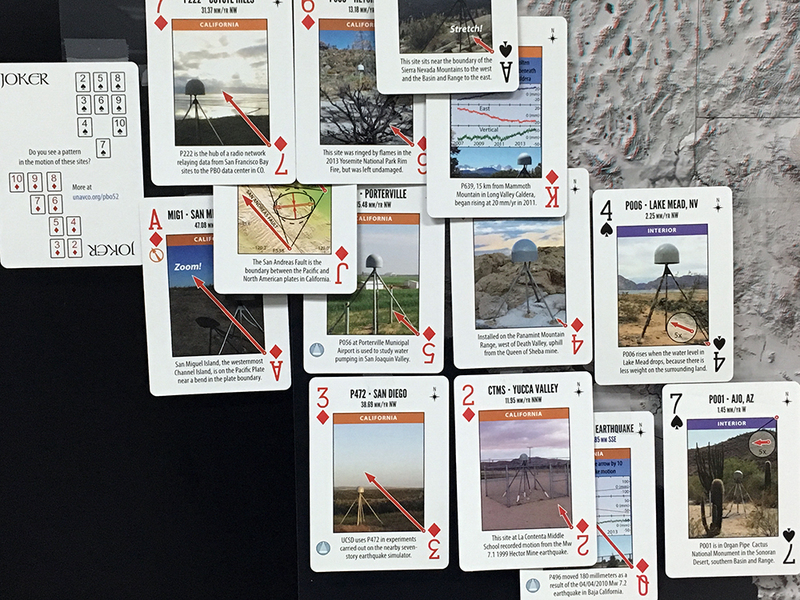 Teachers learned where to find free resources and data on UNAVCO’s website, discussed global plate motions and plate boundaries using the Dynamic Earth map (Figure 5), used the PBO-52 playing cards to explore plate motions in California, the Basin and Range, and the Pacific Northwest, and explored the Tectonic Motions of the Western United States poster. Using different reference frames, teachers worked with the UNAVCO GPS Velocity Viewer to compare tectonic movements of different regions. Teachers in the Arizona workshop compared the Rio Grande Rift in New Mexico with Iceland and the East Africa Rift Zone, while teachers in the Minnesota workshop studied glacial isostatic adjustment and compared tectonic motions of the Midwestern United States with Iceland and Europe. 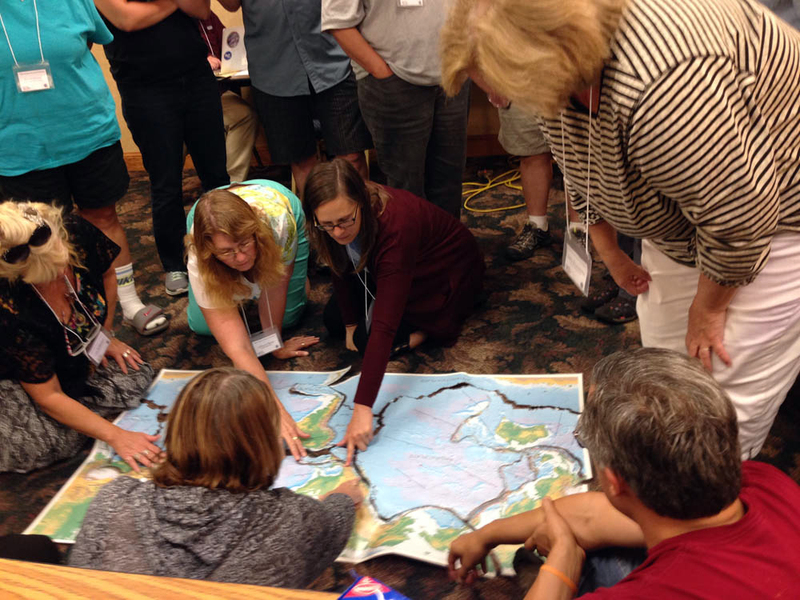 Teachers in the Arizona workshop completed the lesson Visualizing Relationships with Data: Volcanoes, Earthquakes, and Plate Tectonics to learn about the regional tectonics of the western United States. Teachers in the Minnesota workshop worked through the lesson Measuring plate motion with GPS to learn how GPS data is used to measure rifting in Iceland, followed by a discussion of the 1.1-billion-year-old Mid-Continent Rift. Throughout the workshops, participants formed small teams to apply their new knowledge by developing lesson plans incorporating workshop materials to update and enrich their own curricula and activities for their students. 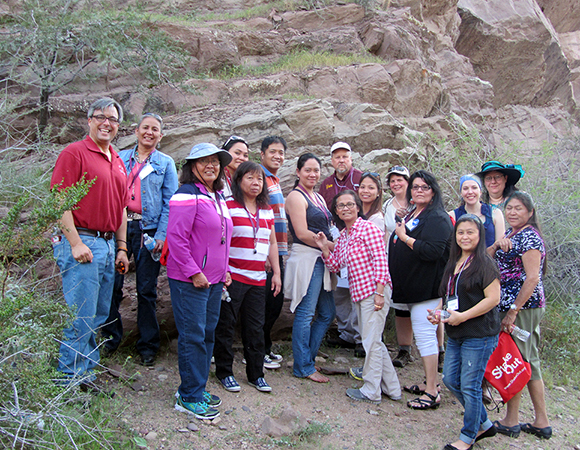 Each workshop had an associated field trip to provide participants hands-on experiences with observing the geology and deformation of the region. 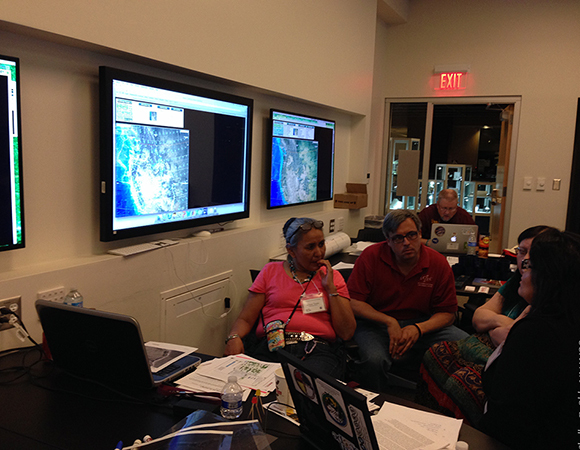 UNAVCO instructed a session at the ESIP Educators Workshop held July 16, 2015 in Pacific Grove, California. A diverse suite of formal college, high school, and park interpreter educators, primarily from Central California, participated in the workshop. 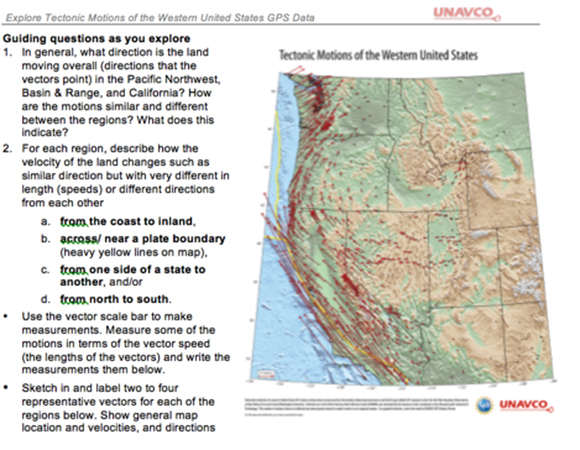 Using the Tectonic Motions of the Western United States poster and the UNAVCO GPS Velocity Viewer online tool, educators studied PBO velocity vectors to explore tectonic motions and discuss the societal implications of these differing motions. At the end of the workshop, the participants discussed how to integrate these resources into their teaching settings. Using a train-the-trainer model, the goal of education-focused workshops is to reach thousands of students by educating those who educate. We provide workshop participants with rich learning experiences about current scientific research from EarthScope and geodesy, so that they can integrate current concepts and engaging teaching methods into their instructional practice, whether it is in a formal classroom setting or through park programs and museum exhibits. 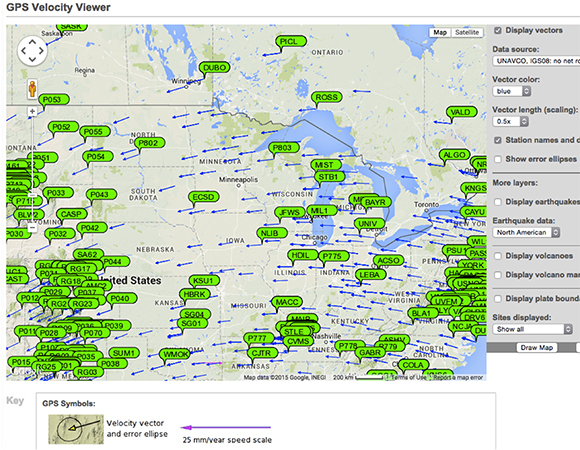 By using this training approach, awareness of EarthScope, UNAVCO, and PBO is increasing through broad audiences.